Sutton is a small community of approximately 1,400 Nebraskans located just over an hour west of Lincoln. Because the closest hospital (see Fillmore County Hospital) is located 25 minutes away, Henderson Health Care Services’ Sutton Family Practice fulfills many medical and laboratory services for the community. When envisioning a new, standalone structure for this clinic, Health Facilities Group was determined to refine an aesthetic design that would inspire pride amongst the people of Sutton. While the existing clinic was located in an aging Long-Term Care building, the replacement facility would be highly visible from its new site near the main highway leading into town. HFG recognized that this prominent display was an opportunity to create a structure for which all members of the community could feel a sense of ownership. 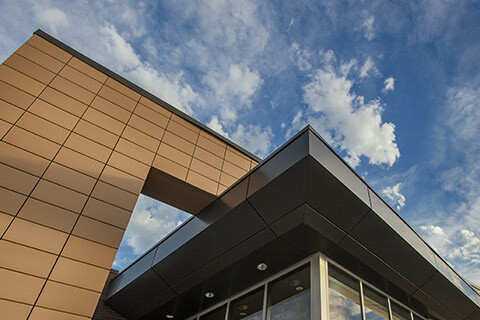 Commenting on the finished building, the CEO of Sutton Family Practice reflected that the replacement facility has completely redefined what healthcare means to the community of Sutton. With its sleek, modern exterior and warm interior, HFG’s ultimate design looks like nothing else in town. Sutton Family Practice is a 5,467 SF, 6 exam room clinic with a procedure room for sutures, casting, and other services. Its new laboratory provides a broad spectrum of lab services, including chemistry, coagulation, urinalysis, and digital X-ray services. Digital X-ray capabilities allow medical professionals to view a result within seconds and send the image directly to off-site radiologists for reading. The facility was designed to accommodate rising numbers of patient visits and increased volume. Key HFG services included healthcare planning, space evaluation & programming, state-of-the-art medical design, economic analysis, estimating services, and construction phasing.